The final rally of this election campaign came before the pivotal day for the party, which is currently in third place according to the latest polls. The party became the official opposition in 2011 due in large part to support in Quebec, but has lost a lot of ground in the province to the Liberal party, according to surveys. The pressure from Justin Trudeau’s party was evident during Mulcair’s speech. He spent as much time criticizing the Liberals as he did Prime Minister Stephen Harper, attempting to frame them as a party of politics­-as­-usual. In particular, Mulcair took jabs at Liberal campaign co-­chair Dan Gagnier, who was found to be advising TransCanada on how best to lobby a Trudeau-­led government. 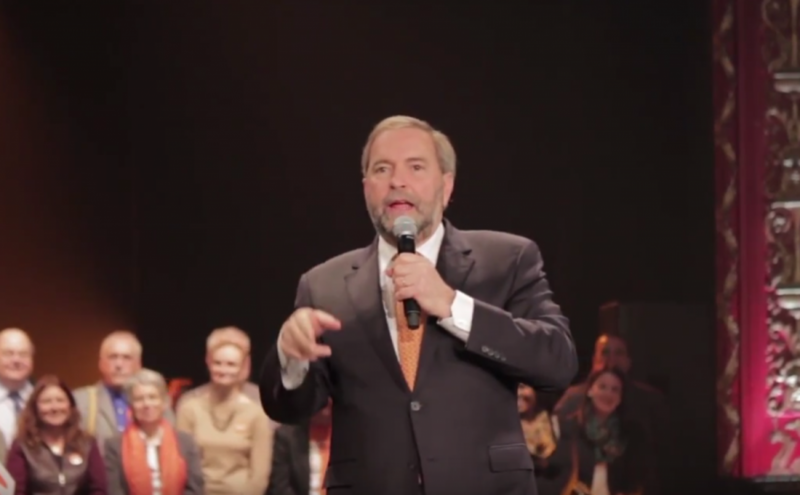 On the eve of election day, Mulcair touted the NDP as the party of real change, and underlined the significance of electing a government that would break the two­-party dynamic that has long defined Canadian politics. While lineups are to be expected at election day polls, Elections Canada reported last Wednesday that there was a sharp increase in early voting this year—up 71 per cent from 2011. In total, 3.6 million Canadians voted at advance polls, including 942,008 in Quebec. Election day polls will be open in Montreal on Monday from 9:30 a.m. to 9:30 p.m.